One fourth or one-third of our lives is spent in bed. That is more than at work. Yet so many people neglect the bedroom or bed when decorating their homes. Usually the bedroom consists of a double bed, a linen closet or wardrobe, maybe a chair, two night stands and a picture of the kids on the wall. The bed usually made up with a regular duvet with cover, two matching pillows, an occasional extra set of pillows with covers in a matching tone, and if the room has no double glazing, an extra blanket or spread. A small TV sits somewhere near the end of the bed or is mounted on the wall. Nothing fancy, but practical. Yet with the right touch and a bit of work the bedroom can be turned into a private sanctuary. The Americans have known this a long time. An abundance of shams, euro pillows, throws, bed skirts, duvets and quilts can can be found in even the cheapest home decorating shop. Target for instance sells amazing quality bed linen for very little. On a recent trip to the US, I got inspired by the US way of making beds. We ourselves have a great bed, a Hästens. But the blue and white checked pattern is a bit overbearing. As ours is a relatively high bed, I thought of buying a bed skirt. 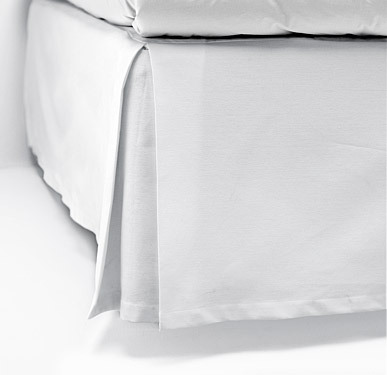 A bed skirt is, like the name suggests, basically a skirt for your bed. This would hide the bald pattern and would also hide the fact that we city dwellers tend to store stuff under our beds. In our case, the spare mattress for guests is tucked underneath, but can be seen from the hallway walking to the room. I was well pleased with my clever idea and started my quest for the ultimate bedskirt. Here they often call it a bed volant. In the US, a good bed seems to begin with the right bedskirt, or dust ruffles as they are called there. They come pleaded, neat, in all colours imaginable and cost from practically nothing to a small fortune. If I had known such a clever product would be so hard to come by here in Europe, I would’ve stocked up in the US. The H&M home collection features one. And for a great price starting at €29.95 It is pretty much exactly what I had in mind, yet the it comes in the wrong sizes. Our bed measures 1.80m by 2.10m, and H&M’s only comes in 2.00m. But I figured if H&M sells it, it might be a Swedish thing in general so I checked out Ikea. They sell a more ruffled bed volant for a sweet €9,95. It fits a 1.80m by 2.10 bed, but is a few centimeters short with 40cm whereas our bed stand 55cm from the ground. I might be able to fix this by covering the top of the box spring with white sheets and then strapping the bed volant around it slightly lower. But it might look as if our bed is dressed like the back-up singers from Wham. As we don’t really have a store like Target or the wonderful Bed Bath and Beyond, (I smell a golden franchise opportunity!) I tried the few smaller bed stores around our neighbourhood. Again I was disappointed because the few bedskirt sold were either too small, ugly or so ridiculously priced that it would be cheaper to fly out to the US and buy a few myself. 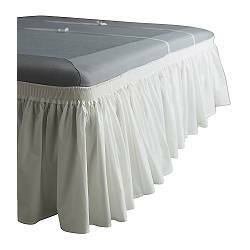 To cut a story short, I have yet to find the right bedskirt. Hastens themselves do sell them but they come in the same checked pattern I am so desperately trying to cover up. Besides, they don’t list the prices on the website which is never a good sign, but when they are on offer on any web-based second-hand store they are often refered to being bought for prices well in the 100’s. As most US web shops don’t ship to non US addresses yet, shopping online can be tedious. There are many stores and shops online that sell amazing bed linen and bedding which are great for inspiration though. If you have a sewing machine you can maybe even make your own bed skirts or other bedroom accessories. However, Amazon, who ship to pretty much all over the globe, started selling home furnishings and bedding not too long ago and stocked up on great collections like Ralph Lauren’s but also more affordable lines. These can be bought trough my own webshop too, as I do not only sell books there. 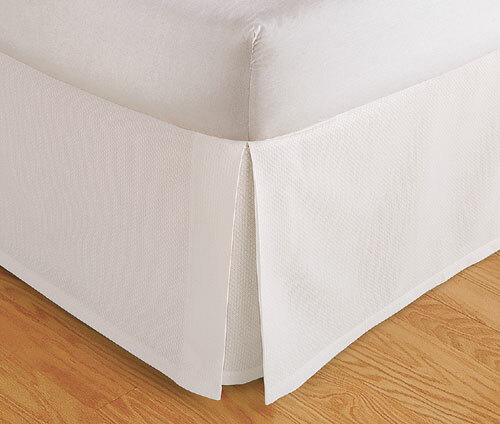 I myself will go ahead and order the perfect bed skirt, bed volant or Dust ruffle right there. The one in the picture here comes at a kind $17.97 before shipping. You can find it here. For great tips and inspiration on how to decorate your own bed or bedroom, check out these and other books from my webshop.